Moving to an assisted living facility or a nursing home can be a complicated, overwhelming process. If you have successfully navigated care needs, toured and selected a facility and figured out all of the necessary details – That is half the battle! Unfortunately, even once you or your loved one is settled into their new place, there can be a ton of work ahead. Often, family support is needed to help coordinate all of the necessary logistics! Moving and packing for yourself is one thing, but moving and packing if you are unable to complete the tasks or have to complete the necessary tasks on behalf of a loved one – Is a whole other ball game. Trying to pack up someone else’s home, or trusting family to pack up your home, can be a daunting task. Start small and work as diligently as possible. Often, nursing homes or assisted living facilities have limited space and therefore much of your belongings (or your loved one) will have to be packed, donated or stored elsewhere. Clearing out the clutter, packing up the sentimental items and packing the essentials for your new home should be the top 3 priorities. Don’t forget to make all the necessary updates! Going through bank statements and credit card statements can be an easy way to account for anything that needs cancelled, or any address updates needed. Many service providers require a statement of residence from the nursing home or care facility to cancel contracts and subscriptions, grabbing one ahead of time can make life easier. Assuming you have gotten much of the sorting and organizing out of the way, having professional help can make the moving (and/or storage) process much easier. Work that could take you or family members several weeks (or months) to complete, can be done easily in a short amount of time. Packing, moving, and if needed, storage services, can all be helpful in making the process and transition as smooth as possible. 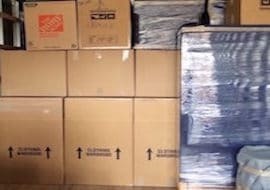 Using a moving company can eliminate the need to pack and label items, supplies and equipment are all provided and long or short term storage is an option. If you or a loved one is moving and needs assistance, please call us today! We can provide a free moving quote and recommend services and support to make the process as easy as possible. When the weather outside is frightful, having movers is delightful! Let it snow, and check out our TOP winter moving tips over the years! Planning for extra time, supplies and moving day with these great winter tips! Make sure your walkways are safe and keep your home protected! Moving electronics in cold weather can take some extra care. Keep an eye on the weather and travel restrictions! If you are moving this winter, call us! Get a free moving quote today. Moving mistakes can take a big toll! Here are the top 4 moving mistakes we see, and tips for making your move as stress-free as possible! Not doing due diligence when selecting service providers. Doing the legwork is critical when you are hiring a realtor, moving company, hiring contractors, hiring a home inspector – Anything that goes along with a move! Having an accurate estimate, seeing reviews and references and selecting a reputable, licensed service provider is key. Wingin’ it and panicking. Moving is no joke. There is a TON of coordination that has to happen, especially if you are buying and/or selling your home. It can be easy to get overwhelmed and then at the 11th hour, decide to ‘wing it’, and just plan to deal with it later. 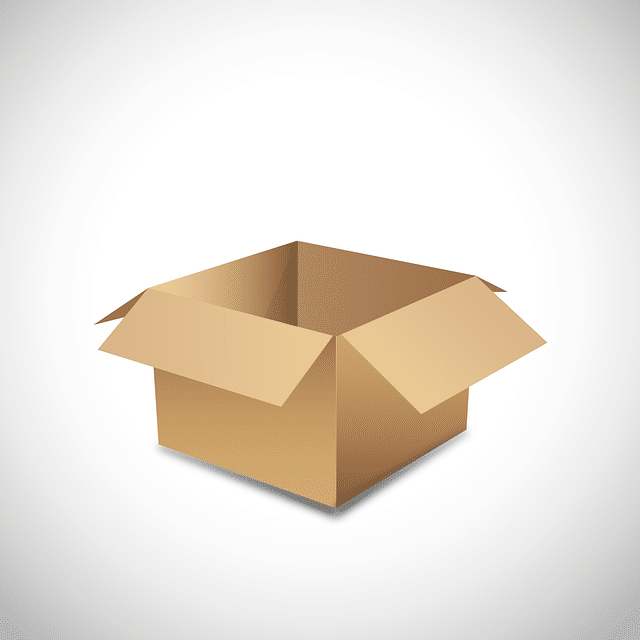 This can have a huge negative impact on your move! Give yourself plenty of time, start early, get organized and make sure that everything gets done the right way. New home woes. Buying a home is the largest purchase decision most of us make. In the competitive market, it can be a delicate balance act to get your offer in quickly while still making a sound decision. Avoid the urge to jump at the bid and get a plan together. Have proper home inspections, ensure that you are making a great decision by really familiarizing yourself with the details of the home, your new neighborhood, etc. Extra costs and budgeting. Aside from the actual up front costs of moving and buying / selling a home, be prepared to budget for other expenses. Whether it’s things on the inspection report that will need prioritized and dealt with, buying furniture, increased monthly expenditures – Have a very clear picture on all costs associated with your move. Moving is a complicated process! While usually an exciting and positive experience, there are definitely some hurdles to be expected along the way. Plan ahead and make your move a great one! Before you hire long distance movers it’s important to understand the types of moving companies out there. We’re here to help! What types of long distance movers are you contacting? Particularly if you are doing online research, it can be difficult to sometimes tell the differences in the types of moving companies out there. Many of them don’t specify in their ads or their websites, and it can take a bit of digging! Brokers – This is very common now, and can be difficult to spot! Some companies will quote a low low starting price to get your information, and then sell your information to multiple types of long distance movers to service the move. Unfortunately, this can be a recipe for disaster! It can be unclear who is doing the move, and thus unclear to determine the type of skill and requirements that your movers have. Be sure to do your due diligence! Van Lines – Van lines will typically provide a pick up date, and then a drop off window / date spread. Your belongings can be transferred from truck to truck and warehouse to warehouse, all loaded with other household moves. If this schedule and timeline works for you, great! For many, the specific delivery date is essential. Dedicated Freight – Dedicate freight means that the company that packs / loads your belongings at your departure is the same company that unloads and delivers your belongings at your destination. This means the company that you select stays with your belongings every step of the way and you get specific pick up and delivery dates. Doing your due diligence can go a long way to ensuring your long distance move is a success! 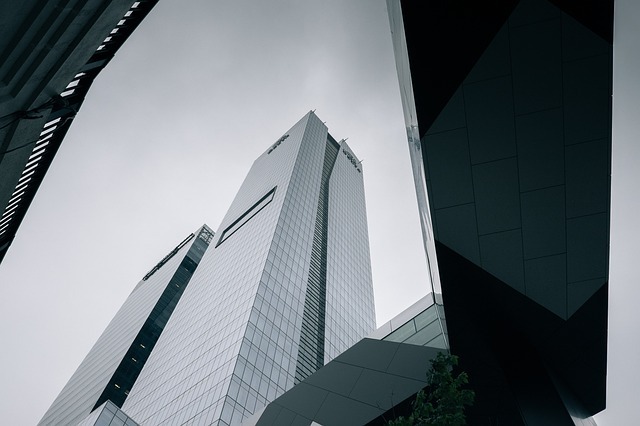 In addition to understanding the types of long distance movers, it’s important to do your research on the company history, reviews, processes and policies. Every year, thousands of people from all around the world decide to take the leap and move to Australia. This is not a surprise since “The land down under” has plenty of things to offer to its new residents. Other than the fact that on average Australia has more than 230 sunny days per year, it has also one of the lowest air pollution levels in the whole wide world. If you add to that the low crime rate, the lowest population density of any continent in the world, and the fact that it indeed is a multicultural society- you can see why it’s one of the best places to live in on Earth. Australia is also a massive piece of land with more than three million square miles, so if you want to travel the country, you will need a lot of time to do so. The rich ecosystems make exploring this island a real adventure; from the sandy beaches and the tropical rainforests, to the golden deserts and even mountains with snow. If you’re from the US and you’re considering moving to this alluring place, you should be prepared before packing your suitcase and hitting the jets. There are some steps that you need to do before you actually step a foot in Australia. Make sure you think through all of these points in order to avoid any problems once you arrive in your new home. Apply for a visa: before going to Australia, you have to have an approved visa. The type of visa that you have to apply for depends on many factors such as the country you’re originally from, whether you’re going there to study or to work, how long are you planning on staying, and more. If you need help with this, you should go to the website of the Australian Department of Immigration and get info. Count your savings: Australia is a place where the average salary is much higher than in the US, and the unemployment rate is around 5%. Although this is a great sign for the country and its strong economy, it can also mean you should expect to have much higher expenses. You should plan to have some capital before you go. Count on having at least AU$5,000 to live through a few months without work. Cut expenses in the US: it doesn’t matter how long you’re going to be living in Oz, you have to be smart and start cutting back on all the things that you can in your home. You won’t need the internet, home phone, Netflix accounts, and more- so you might as well close your accounts. Find accommodations and a job: if you can, you should have these two very essential things lined up before you enter Australia. Some websites where you can find accommodation are Flatmates and Gumtree. Since it’s a common practice in Australia to rent apartments without any furniture, make sure you ask about that before signing the contract. According to http://www.movingtoaustralia.com it helps to have a reference from a place that you rented before. When it comes to job hunting, even though Australia has a low unemployment rate, it might be difficult to find a job right away as soon as you arrive. Try to do your research before going so that you have an idea where to start. Moreover, the opportunity to save cash while having a regular job is the best thing about working there. Try finding something to do at Gumtree, Seek, Careerone, or Taw. Apply for a Tax File Number or TFN: this is similar to a social security number, and you need it if you want to work, file taxes, and more. Open a bank account: don’t keep a lot of cash in your pockets, instead open an Australian bank account which will make everything much easier. Get healthcare insurance: getting healthcare immediately could potentially save you money in the long run. There are different private healthcare packages according to your income. RSA (Responsible Service of Alcohol) certificate: if you want to work in hospitality and either serve or sell alcohol you will need to complete an RSA training regulated by state laws, and after finishing the course you will get your certificate. Buy a power adapter and a voltage converter: if you have chargers, hair straighteners or other appliances, be aware that in Australia the main voltage is 230V 50Hz. Stay left: do not forget to drive on the left-hand side of the road! Usually, you will be allowed to use your driving license during your stay in Australia, except if you’re applying for permanent residency status. Remember the tax return: you could get “extra” cash if you remember to do your tax return, and it’s fairly easy to do it too. The weather: The weather in Australia tends to be very hot. A common misconnection is that it’s always sunny and dry. Actually, the weather can be so turbulent that even Melbourne is known for having four seasons in one day. The sun is very strong: the temperatures are known to rise above 40 degrees Celsius, and the heat is expected to rise in the following years. Furthermore, the ozone layer above Australia is unusually thin which makes the dangerous UV radiation from the sun even worse in this part of the world. It’s critical to protect yourself by using lots of sunscreen, wearing protective shirts and hats, and avoiding the sun in the hottest periods of the day. Fires: Australia experiences up to 50,000 bushfires on average per year, mostly as a result of the dry vegetation, the strong winds and the hot weather. Make sure to listen to the fire warnings and to be very careful, especially in rural areas. Wildlife: Many think of Australia as the land where spiders and snakes attack you everywhere, kangaroos kick you, sharks bit you, and everything is out to get you. Although it can happen, the statistics say that there is no real danger. For example, there are only two deadly spiders for which there is an anti-venom, and nobody has died from a spider bite since 1979. Hopefully these tips have you feeling a little bit relieved about making this major decision. Don’t be afraid to meet some Aussie people and to explore their rich culture. You’re good to go, mate! Author Bio: Jessica is the head of content for https://www.hireamover.com.au – her father’s moving company. In her spare time, she enjoys traveling around the world to different surf spots and tasting the local cuisine. Mover of the Year, round 2! We are proud and excited to have been selected as Move For Hunger 2018 Mover of the Year. This award simply could not be made possible without the generous support of our community! Move for Hunger is an incredible program that aims to rescue food from the trash dump, and instead re-allocate it to those in need in our communities. As part of the Move for Hunger program, our team works tirelessly with our clients and communities to rescue food! Whether it’s food that would normally end up in the trash on moving day, or proceeds from a food drive, gathering and transporting it for meaningful impact is our number one goal! 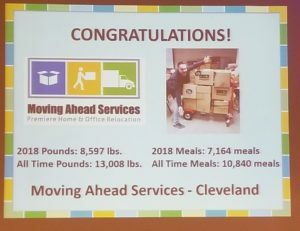 As a result of a HUGE food rescue following the Rite Aid Cleveland Marathon and the Akron Race for the Cure, we were again recognized as the 2018 Mover of the Year! It goes without saying that we simply could not compete and have an impact without thoughtful, generous community support. In 2018, Moving Ahead Services rescued 8,597 pounds of food! This provided over 7,000 meals to individuals in need. As part of the semi-annual Stevens Worldwide Van Lines Conference in gorgeous sunny Florida, we were presented with this incredible recognition. We plan to drive full speed ahead in 2019! Help us help those in need! Donate food on your moving day, let us know about events and organizations that often have food leftover or host a food drive at your business or workplace! We handle all of the logistics! Air BNB is becoming an increasingly popular option for those that own a second residence or that have room in their primary residence to host guests. Not only can it be a great alternative to selling or traditional rentals, but it can also be a flexible way to make some income and maintain your residence! Before you host on Air BNB there is some important information to consider. Whether you are planning to buy a home with Air BNB goals in mind or you are considering your options in your current residence, keep these in mind! Local Regulations – Numero uno should be to consider whether or not your local municipality allows Air BNB. Different cities have different restrictions, some don’t allow it at all while others allow it but in your primary residence or vice versa. Start by looking into local regulations before all else! Demand – Realistically consider where you are and what the draw would be for guests to come and stay at your place consistently. 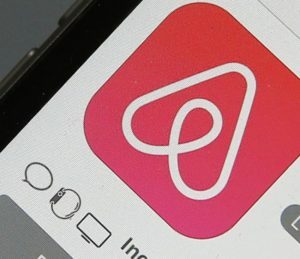 Check out Air BNB as a guest / user and see what competition you are up against, and whether or not you would have luck. Guest or Roommate – Really think about how you feel and how your family feels about having guests in and out, or having strangers staying under your roof (if it’s your primary residence). You may decide to forego Air BNB when you consider the potential constant flow of people in and out. Upgrades and Guest Features – Just like when it comes time to sell or rent, do you have to make any repairs or basic upgrades to accommodate more people? Upgrades and draws are another consideration, in order to have your Air BNB stand out and draw in guests. Time Commitments – Air BNB isn’t a “set it and forget it” project. Unlike long term rentals, your Air BNB hosting will be a constant, continual commitment. In addition to the prep and set up, you have to maintain communication and ensure your home is always ready for the next guest. This can including cleaning, maintenance and more. Damages – Reality is that things will get damaged and broken. You can’t control everything, regardless of how many rules you set. Expect to have to replace and repair furniture and more. Liability and Legal – As with any guest, you may have some legal considerations to factor in. You may also want to consider any ramifications on your mortgage, your HOA or COA and even your insurance policy. Talk to someone who understands the legal side of hosting. Neighbors – Furthering on HOA / COA rules, you have to consider whether or not your neighbors are going to be on board (at least to a point).. Providing detailed information and clear rules can help, but the bottom line is that your neighbors will likely be impacted in some way when guests are flowing in and out. Screening Guests – Setting rules and screening guests is going to take time and assumably must abide by policies you agree to as a host on Air BNB. Get the details before taking the plunge! Reviews and Experience – In addition to everything else, Air BNB is just like an business and you have to consider the guests’ experience while they are there and you may also have to deal with negative feedback and reviews after the fact. Familiarize yourself with the platform, processes and common complaints. Air BNB can be a great option for many, but get the full picture before you take the leap! Are you Planning on Moving to Ontario? Are you planning on moving to Ontario in the near future? If you are, you are in the right place! Relocations can be quite difficult to take on, and getting some professional assistance for your upcoming move might not be a bad idea after all. Keep on reading, and learn how to move to Canada in a few easy steps! Moving is a serious task. It can take a lot of your time and energy. And even more importantly, moving to Ontario can cost you a lot. However, if you find a professional moving company that can land you a hand in this – you just might move with ease and a smile on your face. Start your search for one early. Finding the right mover that can satisfy all your moving needs is harder than it sounds. So, make sure you start looking for yours well before your moving day comes. This move will allow you to think about everything twice, and to make only the good calls. Are you looking for an international moving company? It’s best to start looking for a mover as soon as possible. This way you will avoid all unnecessary stress and common moving mistakes. And believe us – you will want to. And while we are at it, make sure you get well informed before you move. It might take some time – but, it will pay off in a long run. Moving Ahead Services offers its clients two options: full service moving and packing or full service movers without packing. We advise you to think carefully before making your final call. Packing might seem or sound like an easy task to take on, but is it really? Moving to Ontario wouldn’t be so hard if packing was an easy task. Let us help you pack when moving to Ontario, and learn what moving with ease means! Our professional packers can help you prepare your precious belongings for the transport in a safe manner. This aspect is something that is very important to us. We would like you to move with a smile on your face, and that is only possible if your whole relocation project plays out just as planned. Damage to your belongings isn’t any part of this plan. So – make sure you pack your items properly. Or even better, let our packing experts take care of this task for you! Don’t have any packing supplies yet? Don’t worry. We are here to provide you with some. Moving to Ontario with ease is still possible! Check out our website, and learn what we have to offer. And once you do – you will learn why opting for our professional moving assistance was the right choice to make. Need some additional space for your belongings before moving to Ontario? We have you covered. We all find ourselves in this type of situations, and even if it sounds like there is no solution to them – don’t worry. We offer our clients a wide range of storage options, and all you have to do is to pick the solution that fits your needs the best. Our storage facilities are modern, secure and even more importantly – affordable. Figure 3Need some additional space to store your items? We can help you with that, too!